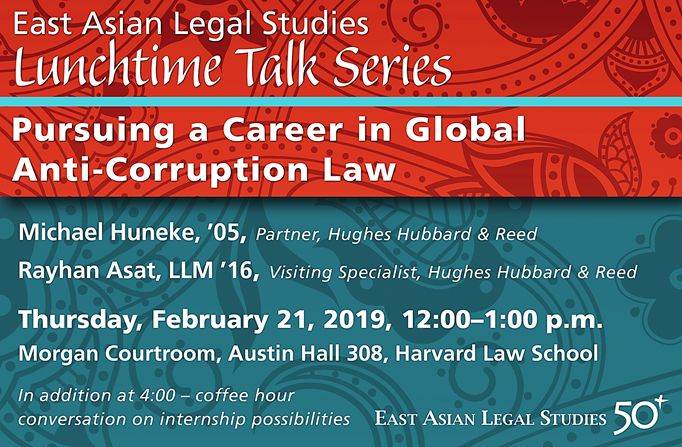 To join the EALS events mailing list, send a blank email to eals@law.harvard.edu with the word SUBSCRIBE in the subject line. Please note: Austin Hall is on the Harvard Law School campus and does not have a street address. The closest address is the building at 1511 Mass Ave, Cambridge MA 02138. Map: http://tinyurl.com/y87ldqmu. Assistive technology on this site is optimized for the Chrome browser. 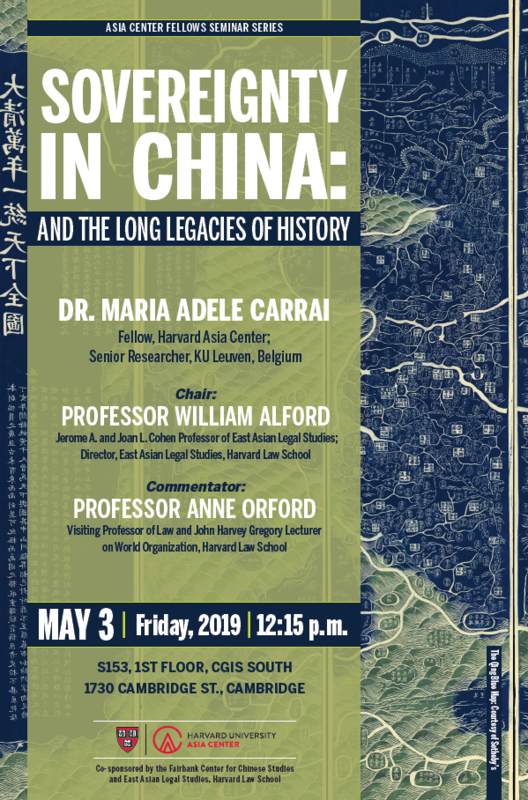 Friday, May 3, 2019, 12:15 p.m.
Alex Wang is Professor of Law at UCLA School of Law, and a leading expert on environmental law and the law and politics of China. 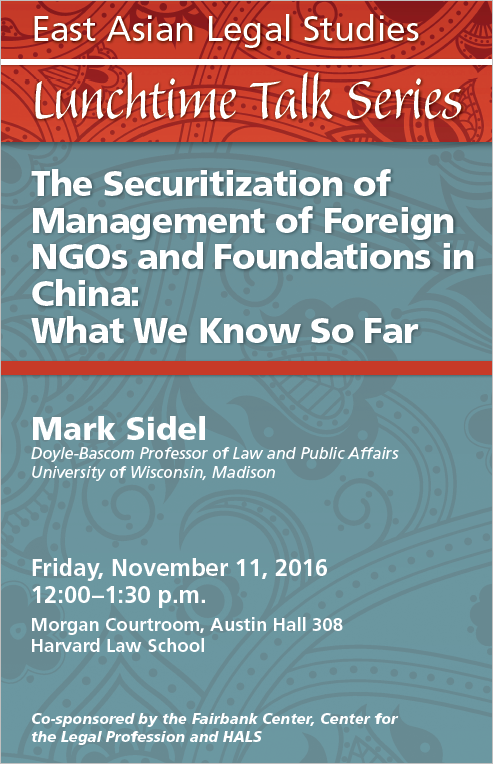 His research focuses on the social effects of law, and the interaction of law and institutions in China and the United States. His previous research has examined, among other things, the institutional design of environmental law and policy, environmental bureaucracy, public interest litigation, information disclosure, and environmental courts. His work has addressed air pollution, climate change, and other environmental issues. At the heart of debates over Chinese rule of law is the question of state legitimacy. Critics argue that legitimacy requires liberal democratic rule of law. Chinese leaders have long relied on performance legitimacy -- economic development and maintenance of social stability -- as the core basis of their rule. Western scholarship on modern Chinese law and politics has, to a significant degree, critiqued the ability of China’s current institutions to perform as claimed. But apart from any actual results that Chinese governance may generate, the entire project of governance reform can be structured in a way that influences public impressions of state legitimacy. The process of reform is not only about attaining performance goals, but is itself a kind of performance. This act of “performing performance” also signals competence, commitment to the people, tradition, nationalist strength, and a host of other positive values to citizens and other audiences. This talk explores the symbolic aspects of Chinese environmental reform and potential implications, drawing on case studies in air pollution, climate change, and China’s Belt & Road Initiative. 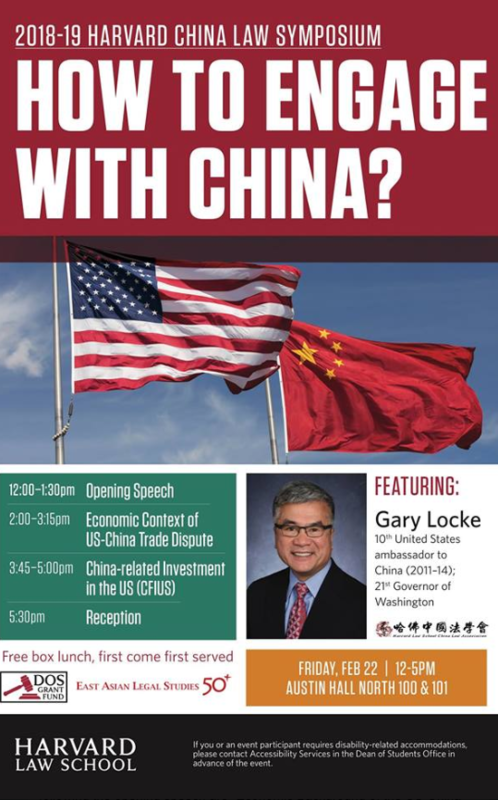 Gary Locke is an American politician and diplomat who served as the 10th United States ambassador to China (2011-14). He was previously the 21st Governor of Washington (1997-2005) and served in the Obama administration as United States Secretary of Commerce (2009-11). Locke is the first governor in the continental United States of Asian descent, and is the only Chinese American ever to have served as a governor of any state. He was also the first Chinese American to serve as the U.S. ambassador to China. 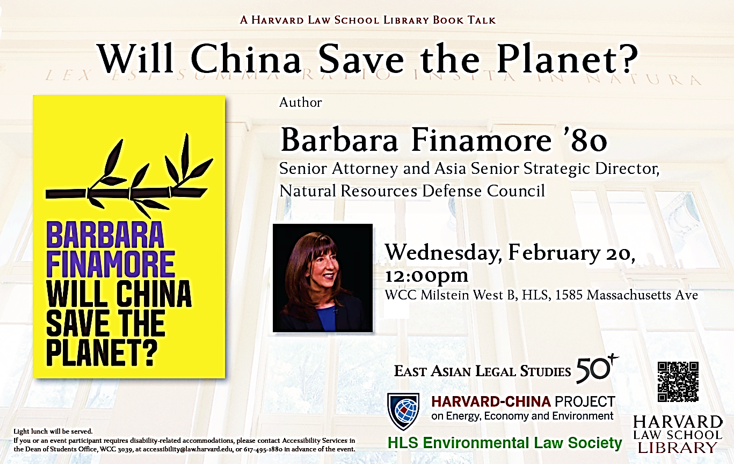 The Harvard Law School Library staff invite you to attend a book talk and discussion in celebration of the recent publication of Barbara Finamore’s Will China Save the Planet? (Polity, Nov., 2018). 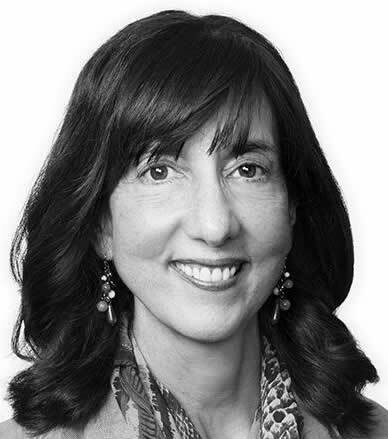 Barbara Finamore is a Senior Attorney and Asia Senior Strategic Director at the Natural Resources Defense Council (NRDC). She has over three decades of experience in environmental law and energy policy, with a focus on China for twenty-five years. In 1996, she founded NRDC’s China Program, the first clean energy program to be launched by an international NGO. A light lunch will be served. 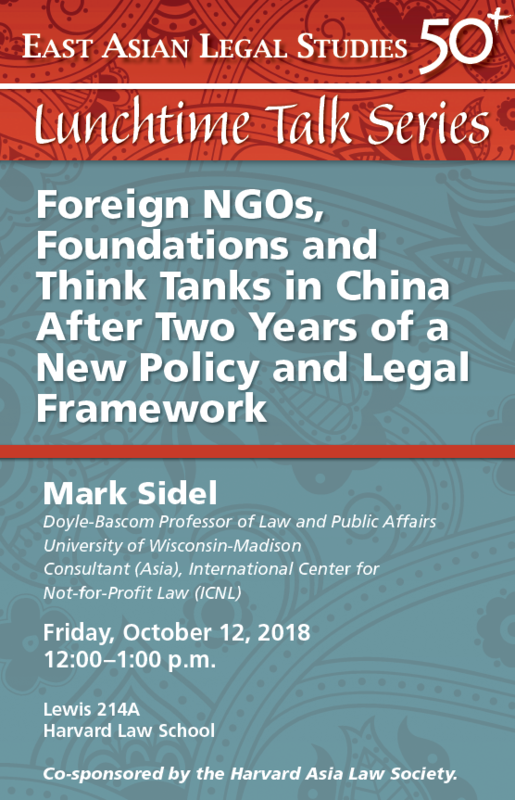 Professor Sidel is currently serving as consultant for Asia at the Washington-based International Center for Not-for-Profit Law (ICNL), focusing on China, India and Vietnam. In 2016 and 2017 he served as the Charles Stewart Mott Foundation Visiting Chair in Community Philanthropy at the Lilly Family School of Philanthropy at Indiana University. 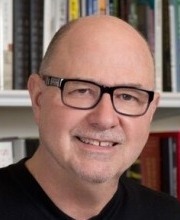 In addition to his academic work, Sidel has served as president of the International Society for Third Sector Research (ISTR), the international academic association working to strengthen research on civil society, philanthropy and the nonprofit sector; on the Community Foundations National Standards Board, the national accrediting and standard setting body for American community foundations and trusts based at the U.S. Council on Foundations; and on the boards of the Association for Research on Nonprofit Organizations and Voluntary Action (ARNOVA) and the Society of American Law Teachers. 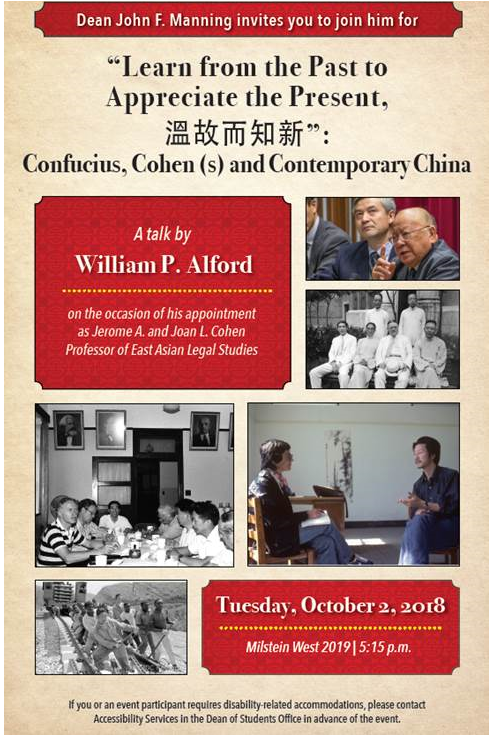 Co-sponsored by EALS, sponsored by the Fairbank Center for Chinese Studies. Co-Sponsored with: Committee on Inner Asian and Altaic Studies; Prince Alwaleed Bin Talal Islamic Studies Program. Adrian Zenz is faculty member in social research methods at the European School of Culture and Theology, Korntal, Germany. His research focus is on China's ethnic policy and public recruitment in Tibet and Xinjiang. He is author of "Tibetanness under Threat" and co-editor of the "Mapping Amdo" series of the Amdo Tibetan Research Network. An opportunity to meet EALS Faculty, Staff, Research Fellows, and the 2018-2019 Visiting Scholars. Light refreshments will be served. 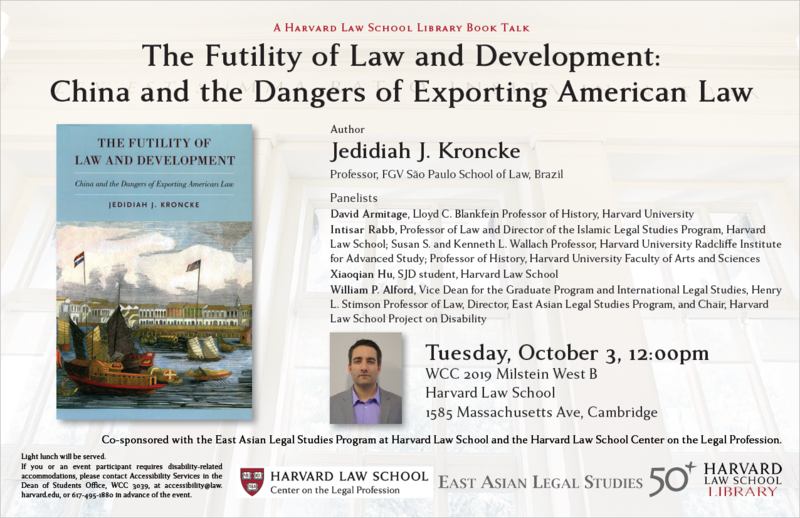 East Asian Legal Studies will host a conference at HLS on Japanese law on September 28 and 29. If interested in attending any or all of the conference, please contact Melissa Smith at masmith@law.harvard.edu or Kim Peterson at kpeterso@law.harvard.edu for details. Mr. Liu formerly served as the Chairman and President of State Grid Corporation of China (SGCC), the world’s largest utility company. He is currently the Chairman of GEIDCO, a United Nations- and SGCC- affiliated organization that promotes grid interconnection worldwide to facilitate development of renewable energy. In this public lecture, Mr. Liu will focus on low-carbon energy transition through innovative strategies that help to integrate energy systems across regions and the world. 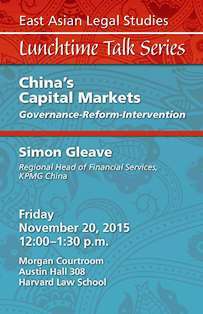 The event will be conducted in Mandarin Chinese and English. Simultaneous Mandarin Chinese and English interpretation will be available. Please plan to arrive at least fifteen minutes early and bring a government- or university-issued photo ID if you would like to check-out a headset to listen to the interpretation. 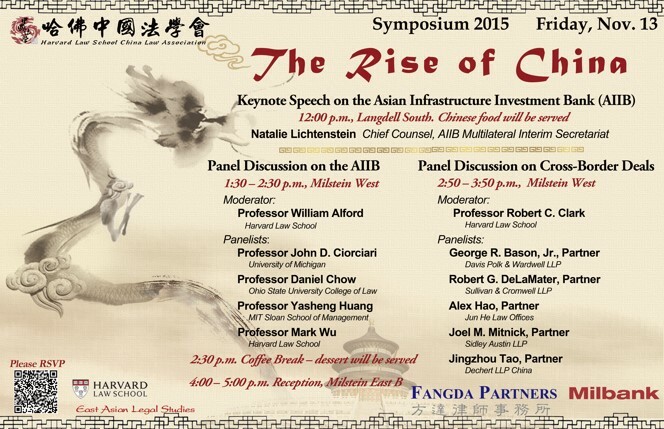 This event is co-sponsored by the Harvard-China Project on Energy, Economy, and Environment; the East Asian Legal Studies Program at Harvard Law School; the Harvard John A. Paulson School of Engineering & Applied Sciences; and the Harvard Global Institute. 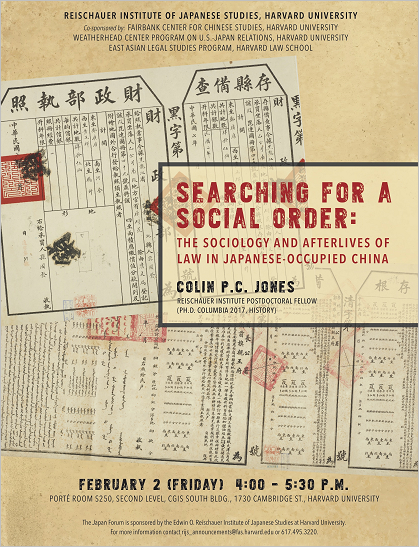 Friday, February 2, 4-5:30 pm, Porte Room S250, Second Floor, CGIS South Building, 1730 Cambridge St. 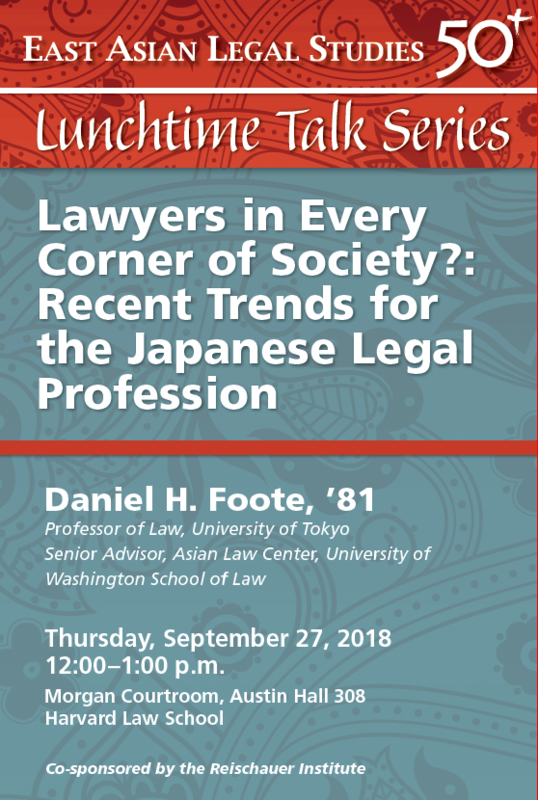 This talk connects the legal history of the Japanese empire to the broader history of legal and social thought in the twentieth century. It examines the design, execution, and long afterlife of the North China Rural Customary Law Survey. Conducted from 1940 to 1944, the survey was unprecedented for the ethnographic approach it took to its subject. 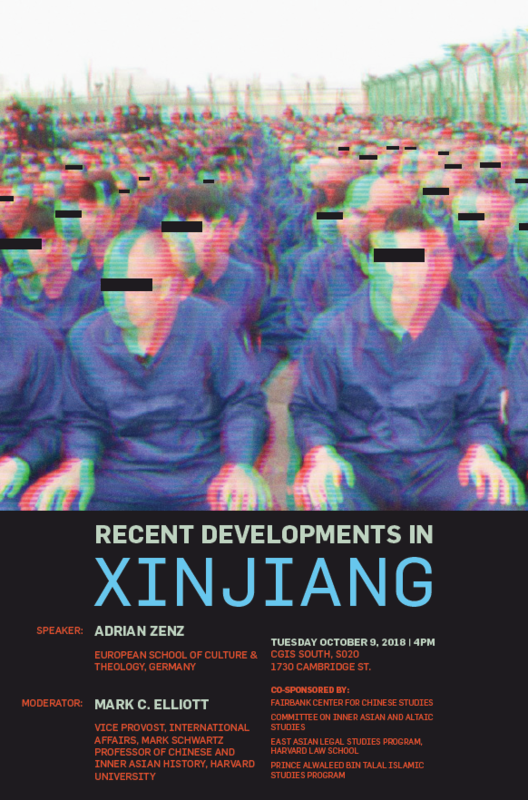 Through interviews with Chinese villagers, its researchers sought to uncover the intricate web of customary practices, associational norms, and religious beliefs that coordinated and regulated daily life independently of the state—or what survey’s designer, Suehiro Izutarō, called the “living law.” I trace this concept to its inception in Habsburg Central Europe and show how, through its implementation in northern China, it continues to shape our understanding of East Asian legal systems. A non-pizza lunch will be served. Please note the revised date: Wed, Jan 10 is the correct date. Videos of the Sept 25, 2017 FY Chang Anniversary Event Panels are now viewable, see below at 9/25. Video of the Oct 28 Bicentennial panel is linked below as well. 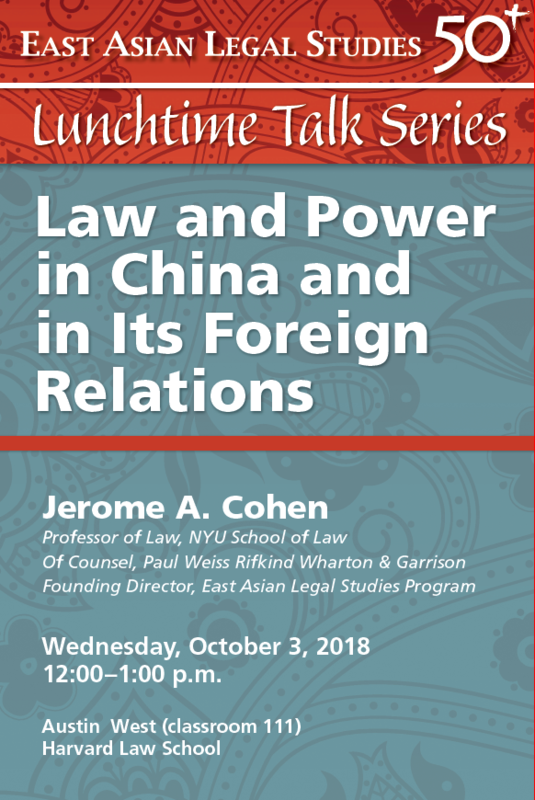 Jerry Cohen established EALS at Harvard Law School some five decades ago to promote the study of the law and legal history of the different jurisdictions of East Asia and their interaction between themselves and with the United States. 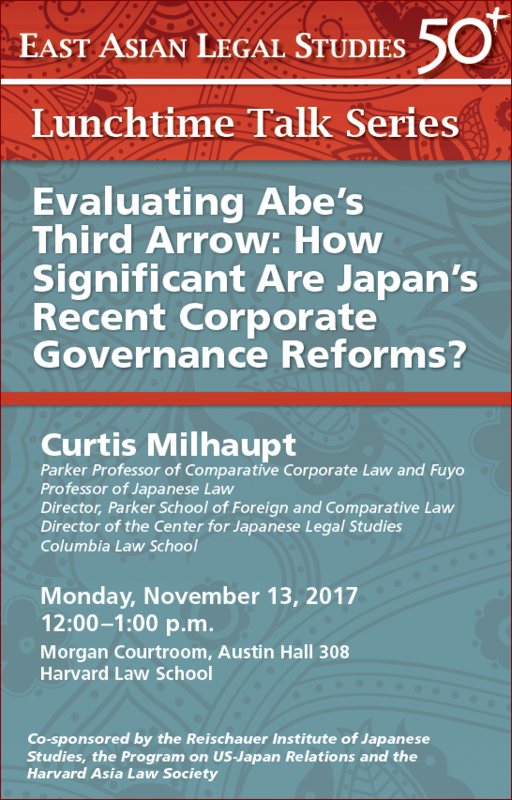 Evaluating Abe's Third Arrow: How Significant are Japan's Recent Corporate Governance Reforms? Belfer Case Study Room S020, Concourse Level, CGIS South Bldg., 1730 Cambridge St. 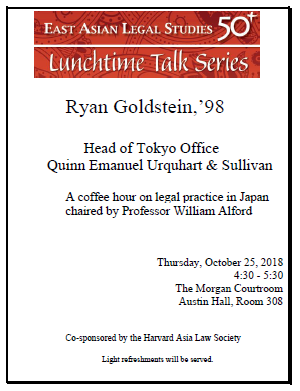 This conference is the third and culminating event in a series of gatherings since the establishment of a joint research agreement between the Harvard University Reischauer Institute of Japanese Studies and the Keio University Faculty of Law in 2015. The focus of this conference is civil society activism and participation in the debate surrounding constitutional revision in Japan, as well as the current debate as an aspect of Japanese domestic politics and international relations. The Domestic Challenge of Globalization: What Policies are Necessary for Addressing Those Left Behind? Please see the HLS in the World website for the Bicentennial events taking place October 27-28. F.Y. Chang (Chang Fu-yun or Zhang Fuyun) graduated from HLS in 1917. He was the first Boxer Indemnity Scholar to do so. Click here to see the F.Y. Chang exhibit. 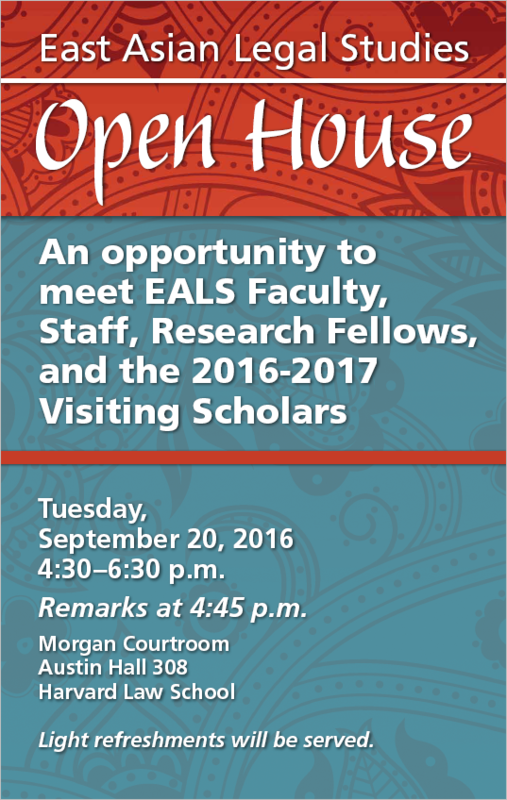 An opportunity to meet EALS Faculty, Staff, Research Fellows, and the 2017-2018 Visiting Scholars. Light refreshments will be served. Book Talk: "Park Chung Hee and Modern Korea: The Roots of Militarism, 1866 - 1945"
Monday, April 10, 2017 12-1 pm, WCC 3019, HLS | Chinese food will be served. On January 1, 2015, amendments to China’s Environmental Protection Law went into effect that would allow an estimated 700 Chinese NGOs to bring lawsuits against polluters on behalf of the public interest. The Supreme People’s Court then issued an authoritative “interpretation” that provides clarification and needed details to this new public interest environmental law system. These new rules appear to be designed, in many ways, to make it easier for Chinese NGOs to sue polluters. Yet many challenges still remain. 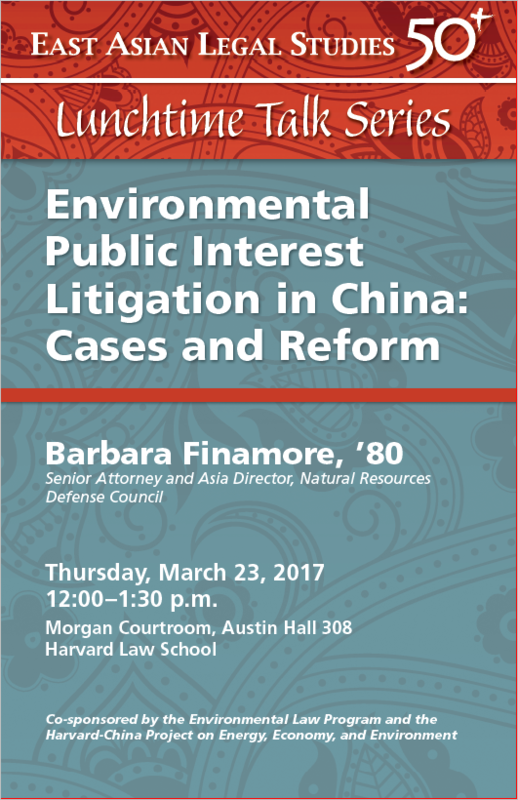 This presentation will provide an overview of the current status of environmental public interest litigation in China, including case studies, challenges and reform efforts. 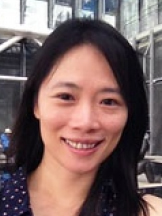 Ms. Finamore will also lead a China Project Research Seminar “Building Energy Efficiency in China: Policies and Trends” at 3:30 in Pierce Hall, room 100F, 29 Oxford Street. Energy used in buildings is responsible for 30% of China’s CO2 emissions, a percentage that is expected to grow as China continues to urbanize and transition to a service economy. China has developed a variety of policy tools designed to reduce building energy consumption and waste, including building energy codes, policies and programs to promote the green building sector, and targets and incentives to expand energy efficiency retrofits for existing buildings. This presentation will outline some of China’s key policies and initiatives to improve building energy efficiency, discusses several outstanding challenges and conclude with an overview of latest developments. 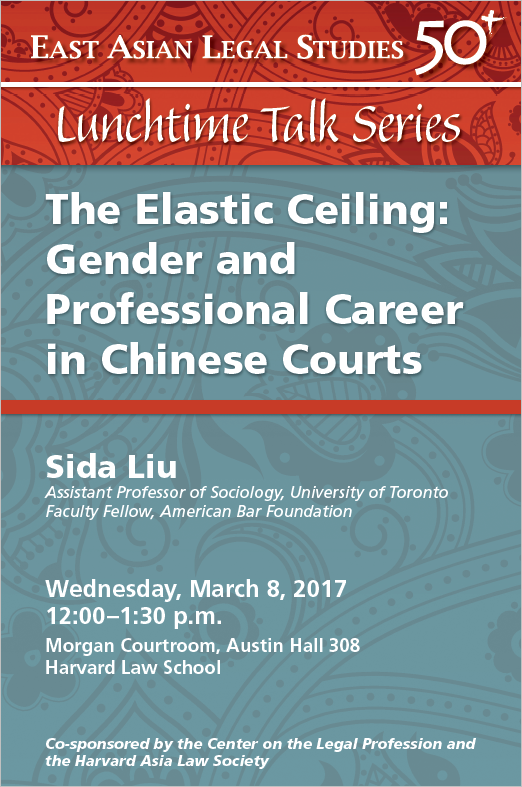 Sida Liu is Assistant Professor of Sociology at the University of Toronto, Faculty Fellow at the American Bar Foundation, and a Member of the Institute for Advanced Study in Princeton in 2016-2017. Before moving to the University of Toronto, he taught sociology and law at the University of Wisconsin-Madison. He received his LL.B. degree from Peking University Law School and his Ph.D. in sociology from the University of Chicago. 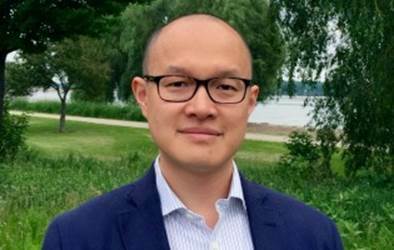 Professor Liu has conducted extensive empirical research on China’s legal reform and legal profession, including the globalization of corporate law firms, the political mobilization of criminal defense lawyers, the feminization of judges, and the career mobility of law practitioners. In addition to Chinese law, he also writes on sociolegal theory and general social theory. Professor Liu is the author of three books in Chinese and English, most recently, Criminal Defense in China: The Politics of Lawyers at Work (with Terence C. Halliday, Cambridge University Press, 2016). He has also published many articles in leading law and social science journals, including the American Journal of Sociology, Sociological Theory, Law & Society Review, Law & Social Inquiry, etc. Cambridge University Press, Fall 2016: The US occupation of the Philippine Islands in 1898 began a foundational period of the modern Philippine state. With the adoption of the 1935 Philippine Constitution, the legal conventions for ultimate independence were in place. 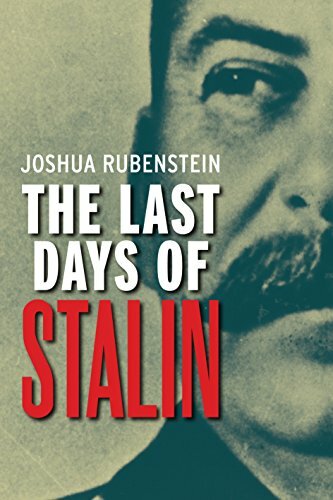 In this time, American officials and their Filipino elite collaborators established a representative, progressive, yet limited colonial government that would modernize the Philippine Islands through colonial democracy and developmental capitalism. Examining constitutional discourse in American and Philippine government records, academic literature, newspaper and personal accounts, The Foundations of the Modern Philippine State concludes that the promise of America's liberal empire was negated by the imperative of insulating American authority from Filipino political demands. Premised on Filipino incapacity, the colonial constitution weakened the safeguards that shielded liberty from power and unleashed liberalism's latent tyrannical potential in the name of civilization. This forged a constitutional despotism that haunts the Islands to this day. Examining American colonial constitutionalism, this book yields insights for legal historians, comparativists, post-colonial scholars, and Southeast Asia specialists. 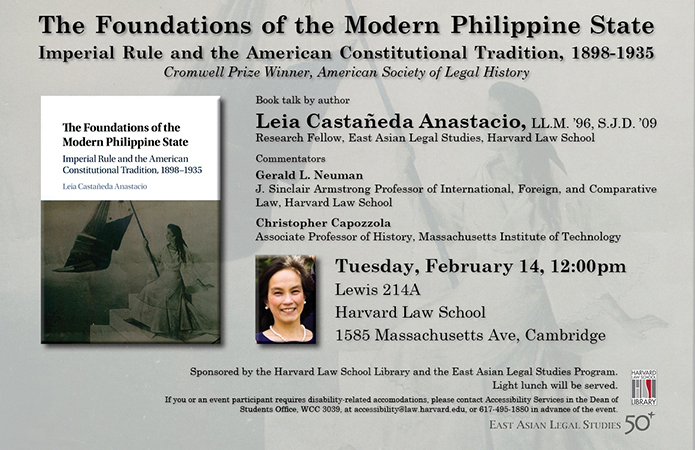 Its focus on the use of American political models in Philippine colonial state-building and development will resonate with law and development scholars and political scientists specializing in American political development. How Far is China from Rule of Law? Professor He Haibo, Tsinghua University School of Law, EALS Visiting Scholar. Moderator: Tarek Masoud, Sultan of Oman Professor of International Relations, Ash Center. 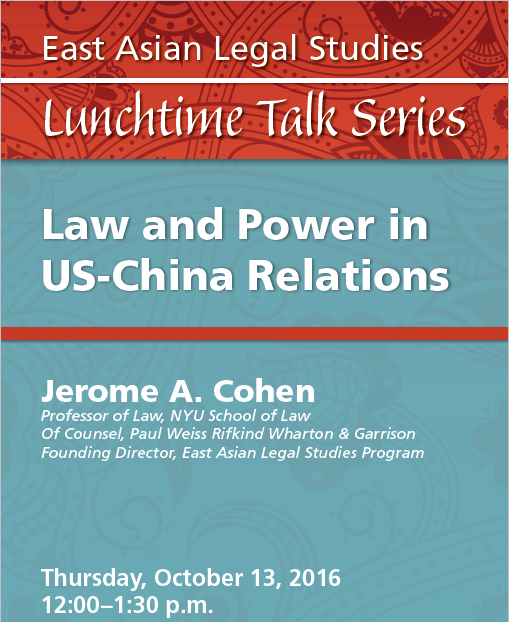 Join the Ash Center and co-sponsor East Asian Legal Studies as Professor He discusses China’s ongoing struggles to establish and respect the rule of law. What progress has Beijing made and what obstacles remain before we can confidently claim that China strongly adheres to the rule of law? 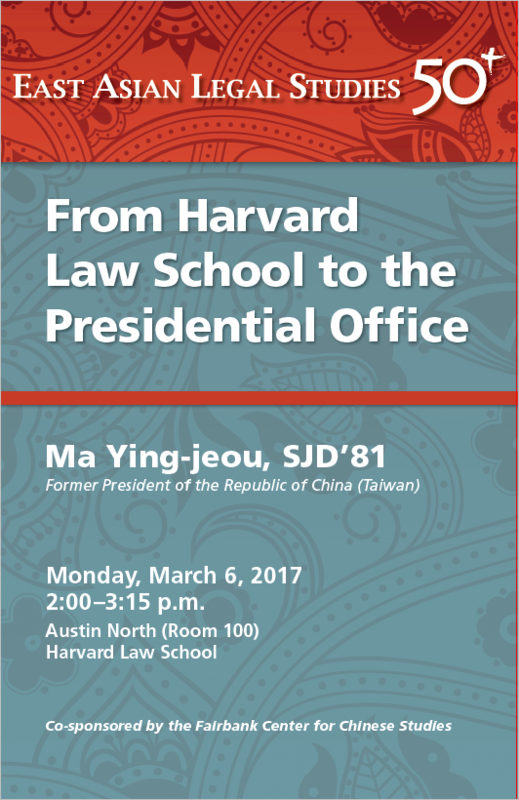 Sponsored by the Ash Center for Democratic Governance and Innovation, Harvard Kennedy School, co-sponsored by EALS and the Fairbank Center for Chinese Studies. "Rights Protection for Persons with Mental Disabilities in China"
Many Mongolian-language archival documents have revealed the existence of at least three realms of judicial practice in Qing Mongolia (1644-1912): the Qing colonial legal system, the native Mongolian way of justice, and the contradiction, or, more broadly, the relationship between the two. This talk takes insight from the Mongolian context, differing from mainstream scholarship that tends to assume the Qing colonial legal system had a widespread effectiveness in Mongolian society at that time. In other words, it explores the native Mongolian justice system during the Qing dynasty, and to some extent, its relation with the Qing colonial legal order. By looking at the justice system, which was closely interrelated to both administration and law, this talk analyzes how and why native Mongolians persistently preserved and innovatively developed their own traditional legal-administrative order under Qing colonial rule. The narrative of the "Mongol way" has implications for theories of imperialism and law. 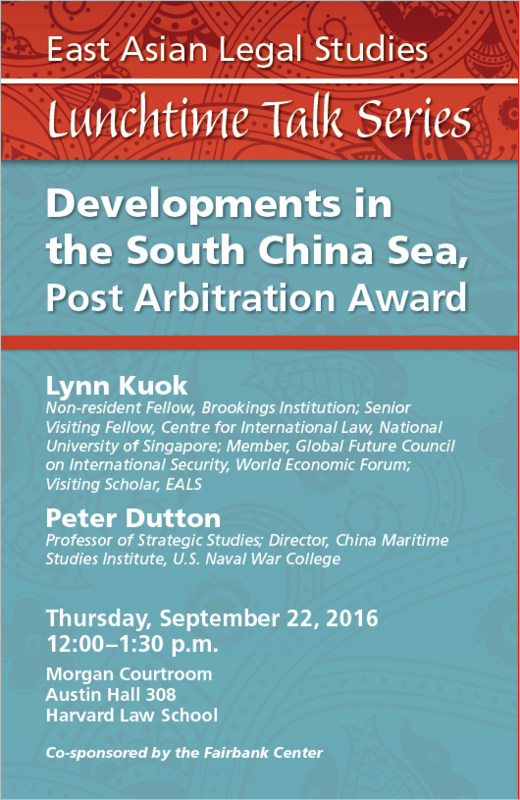 Please join China Law Association for our Annual Symposium. This year's theme is The Rise of China, evidently manifested by the establishment of the Asian Infrastructure Investment Bank (AIIB) and the growth of Chinese outbound investments and cross-border deals. 12:00 Keynote Speech on the AIIB by Natalie Lichtenstein, Chief Counsel, AIIB Multilateral Interim Secretariat in Langdell South.1:30 - 2:30 Panel on the AIIB in Milstein West. 2:50 - 3:50 Panel on Cross-Border Deals in Milstein West. 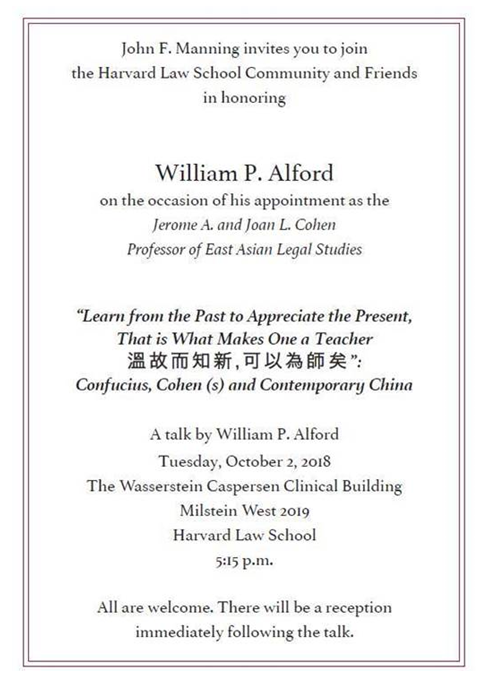 This lecture is part of a series entitled "Democracy and China: Philosophical-Political Reflections" sponsored by the Fairbank Center for Chinese Studies, the Edmond J. Safra Center for Ethics, the Political Theory Colloquium, EALS, and the Philosophy Colloquium at Harvard University. Twelve Pacific Rim countries reached the Trans-Pacific Partnership on October 5, an agreement the New York Times is calling the "largest regional trade accord in history." Join us as Professor Mark Wu discusses the background, provisions, and implications of the TPP. Thai food and boba tea will be served. Please join us for a screening of This Kind of Love, a documentary that tracks the journey of Aung Myo Min, the first openly gay activist in Burma’s democracy movement, from his role in the 1988 student uprising to his time in the student army in the jungle camps to his emergence as a leading human rights defender. The story follows Myo as he returns home after 24 years in exile to be part of Burma’s political transition towards democracy. Aung Myo Min will be in attendance, and participate in a discussion with Wai Wai Nu, Director, Women Peace Network Arakan, moderated by Professor Tyler Giannini. Please join CLA for a discussion about current events surrounding politics in Hong Kong. CLA has invited Visiting Professor Ming Wai Lau to deliver a lecture on "Post-Occupy Politics in Hong Kong and Mainland-HK Relations." Mr. Lau holds a Bachelor's Degree in Laws from King's College London, a Master's Degree in Laws from London School of Economics and Political Science from University of London and a Doctor of Philosophy Degree in Laws from King's College London. Mr. Lau is also the CEO of Chinese Estates Holdings. Professor William Alford will introduce the speaker. Chinese food will be served. Rangita is a women’s human rights scholar and practitioner with expertise in China. She has more than 25 years of experience working globally in over 25 countries. She was the inaugural director of the Woodrow Wilson Center’s Global Women’s Leadership Initiative and the Women in Public Service Project launched by Secretary Hillary Clinton and the Seven Sisters Colleges. 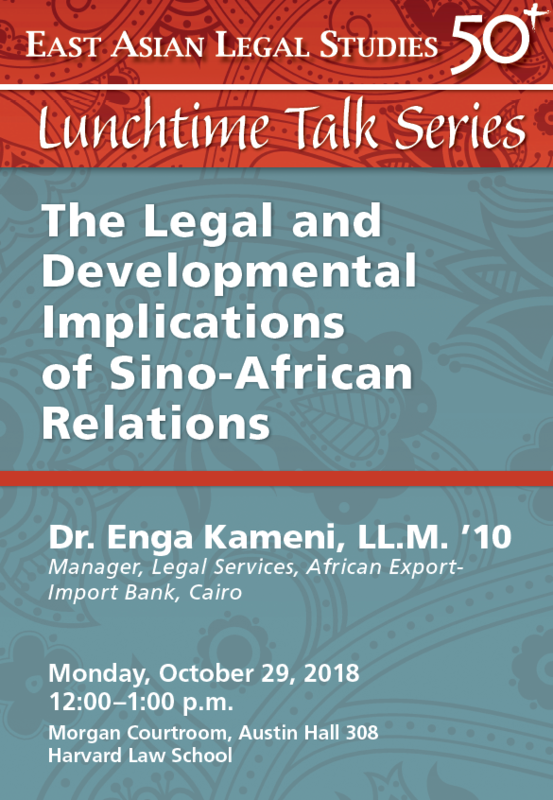 Rangita was also Teaching Fellow with the European Law Research Institute at HLS and a Research Fellow with the Women and Public Policy Program at the Harvard Kennedy School. "Negotiating the UN Convention on the Rights of Persons with Disabilities: An Insider's Perspective"
Please join us for a brown bag discussion with Ambassador Luis Gallegos, who chaired the first half of the negotiations on the UN Convention on the Rights of Persons with Disabilities, and is a current board member for the Special Olympics. He has previously served as Ecuador's Ambassador to the United States, as Ecuador's Permanent Representative to the United Nations, and as a Member of the UN Committee Against Torture. Non-Pizza Lunch Will Be Served. Sponsored by the Program on US-Japan Relations seminar. 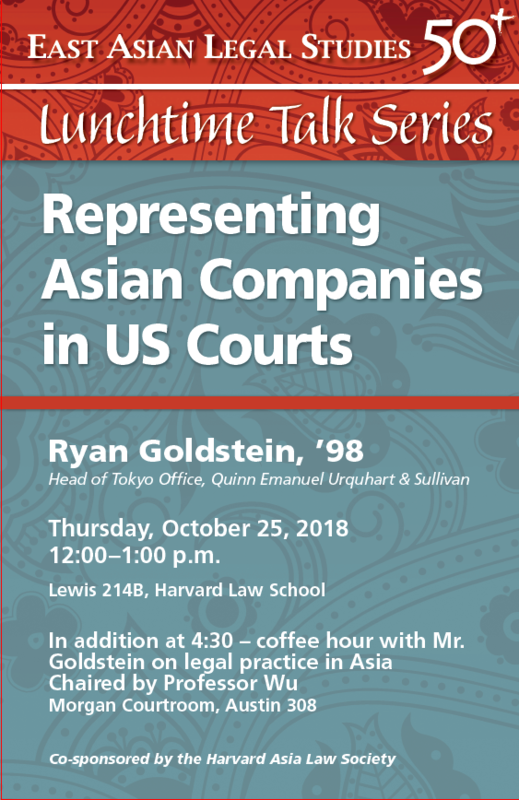 Co-sponsored by HALS, the Harvard Asia Law Society. Asian lunch will be served. "The Long March to Reducing Carbon Emissions in China" featuring Dan Dudek, VP, EDF China with commentary by Professors Jody Freeman and Richard Lazarus. As part of Harvard Climate Week, the Harvard Environmental Law Program is excited to welcome Dr. Dan Dudek, Vice President of the Environmental Defense Fund's China office, to campus. Dr. Dudek is one of the world's leading experts in developing cap-and-trade programs to reduce pollution at the lowest possible cost. He is widely credited with developing the cap-and-trade model that led to dramatic reductions in sulfur dioxide, the leading cause of acid rain, in the U.S. Dr. Dudek now leads EDF's China office, where he designs carbon demonstration projects and develops market mechanisms to address large-scale environmental problems. Sponsored by the Harvard Environmental Law Program. Lunch provided. "Ties to the Top: The Role of Government Officials in Human Rights Abuses in Myanmar"
As Myanmar approaches its second election later this year, join us for a discussion about accountability and its place in the country’s reform efforts. Panelists Roger Normand, of Justice Trust, and Matt Smith, of Fortify Rights, will join two advocates from Myanmar: U Teikkha Nyana, a Buddhist monk who was severely injured two years ago when riot police used white phosphorus weapons to attack peaceful protesters; he recently joined with other injured monks to file an unprecedented lawsuit against the local police chief and the Home Affairs Minister. U Aung Thein, a Supreme Court advocate from Yangon who has represented more than 150 political prisoners, including leaders of the Saffron Revolution and Generation 88. 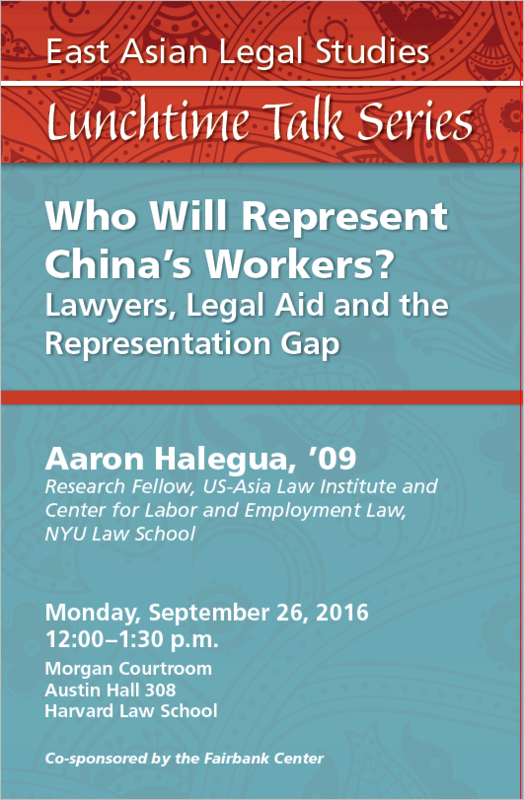 Sponsored by the HLS Human Rights Program, co-sponsored by East Asian Legal Studies. "Exchange of Information Among Tax Authorities: Strengthening the Rule of Law in Asia"
"Documenting Human Rights Conditions in Repressive Regimes: The Case of North Korea"
There is a paper that will be discussed at this talk -- if you would a copy emailed to you, please email eals@law.harvard.edu. 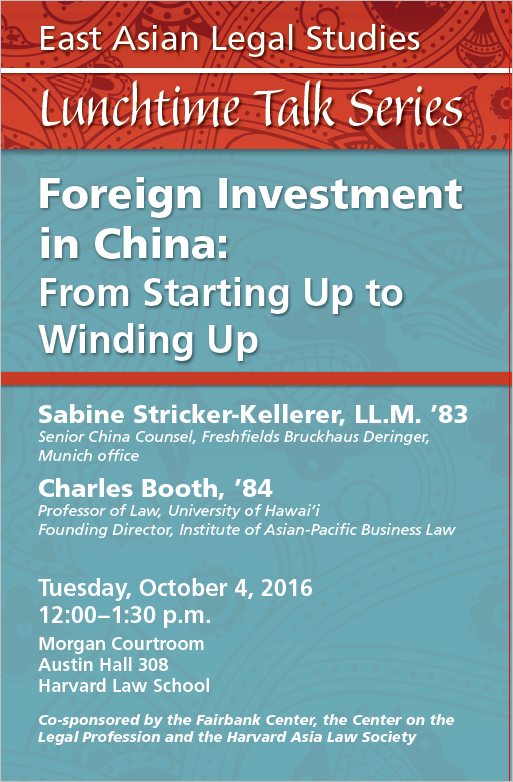 Co-sponsored with the China Law Association. Compulsory Land Collectivization and Exclusive Urbanization: The Main Causes of Much Worsened Income Distribution in China? Join us to meet faculty and staff and hear about the program. 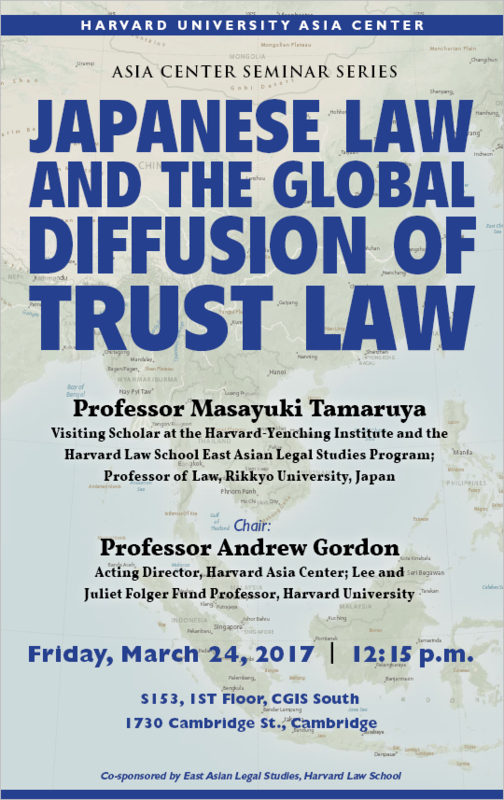 Co-sponsored by East Asian Legal Studies and the Harvard Asia Law Society. Lunch provided. His new book is Confucian Perfectionism: A Political Philosophy for Modern Times. 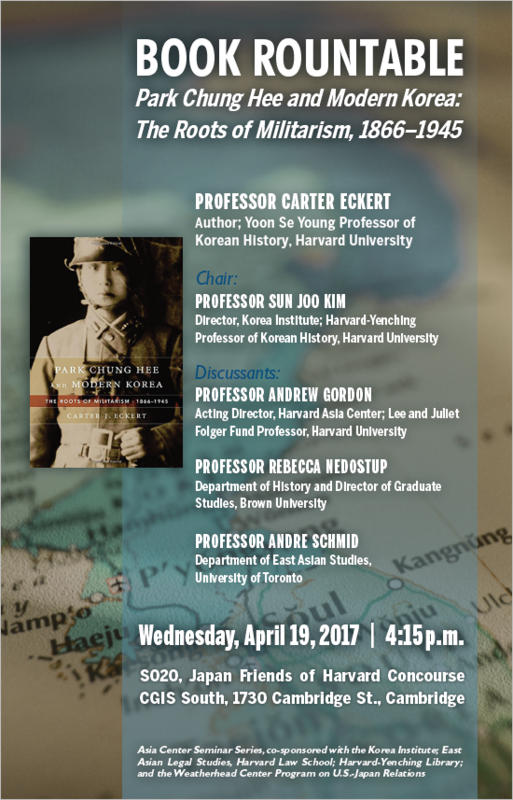 A Kim Koo Forum sponsored by the Korea Institute, Harvard University. This talk will be followed by a public reception. Co-sponsored by EALS and the Ash Center for Democratic Governance and Innovation, HKS; Belfer Center for Science and International Affairs, HKS; the Weatherhead Center for International Affairs. 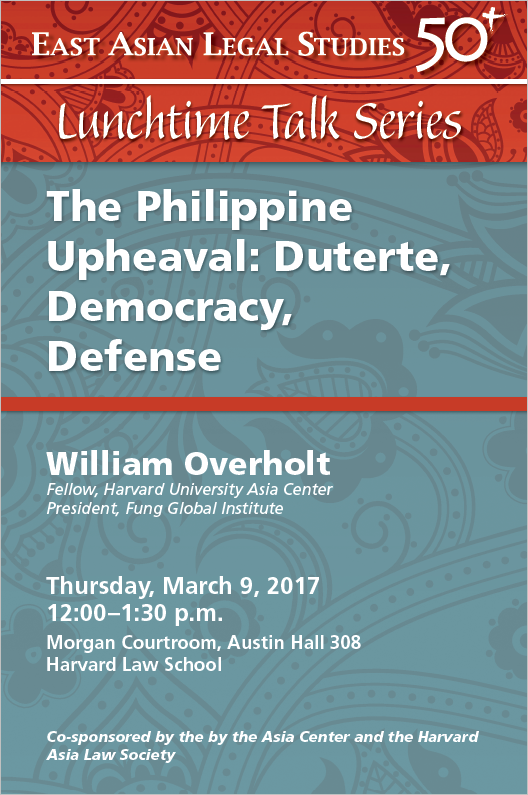 Co-sponsored by the Harvard Asia Law Society, HLS Advocates for Human Rights, the Harvard Human Rights Journal, and EALS. Light refreshments. Civil Society in China: The Legal Framework from Ancient Times to the “New Reform Era"
Changing Labor Relations and Employment Policies in Japan: Fairness for Non-standard Employees? The talk will be in English with Power Point. The Q & A and discussion will be in Korean, with translation provided. Co-sponsored by EALS and the Kim Koo Forum on Korea Current Affairs at the Korea Institute, Harvard University. Currently based in Shanghai with more than 20 years experience living and working in China, Mr. 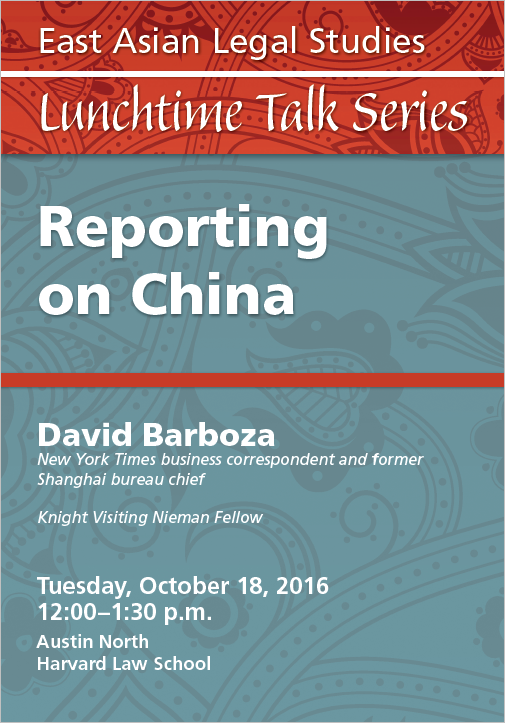 Harder will discuss current issues in the Chinese political economy and their impact on inbound and outbound China transactions. The talk will be chaired by Paul Chang, Associate Professor of Sociology, Harvard University. A public reception will follow the talk. 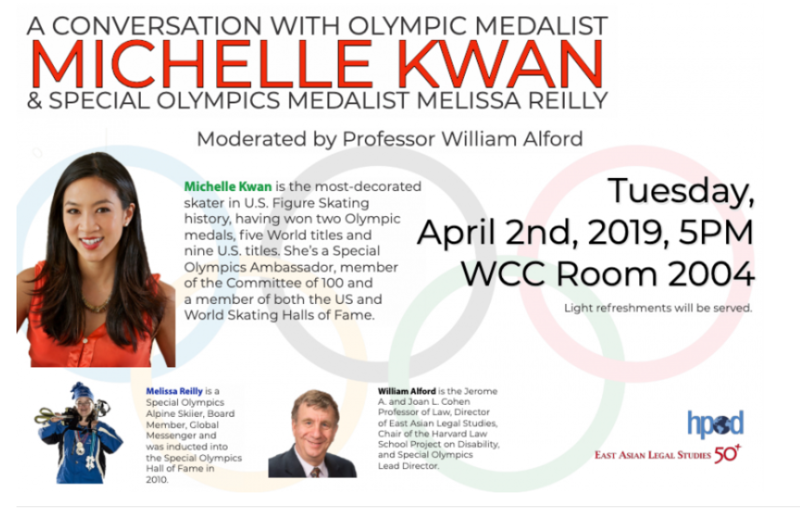 Please note location: The Thomas Chan-Soo Kang Room (S050) of CGIS South Building, 1730 Cambridge Street, Cambridge (Center for Government and International Studies, Harvard University). 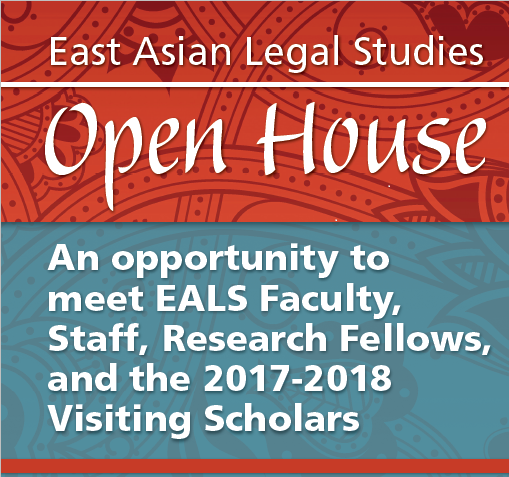 Orientation to the East Asian Legal Studies program, and a chance to meet the current Visiting Scholars and staff and faculty. Thursday, March 28, 2013 3:30-4:30 pm Pierce Hall, 100 F, 29 Oxford St. Constitutional Adjudication of Japan: Is the Supreme Court of Japan So Conservative? 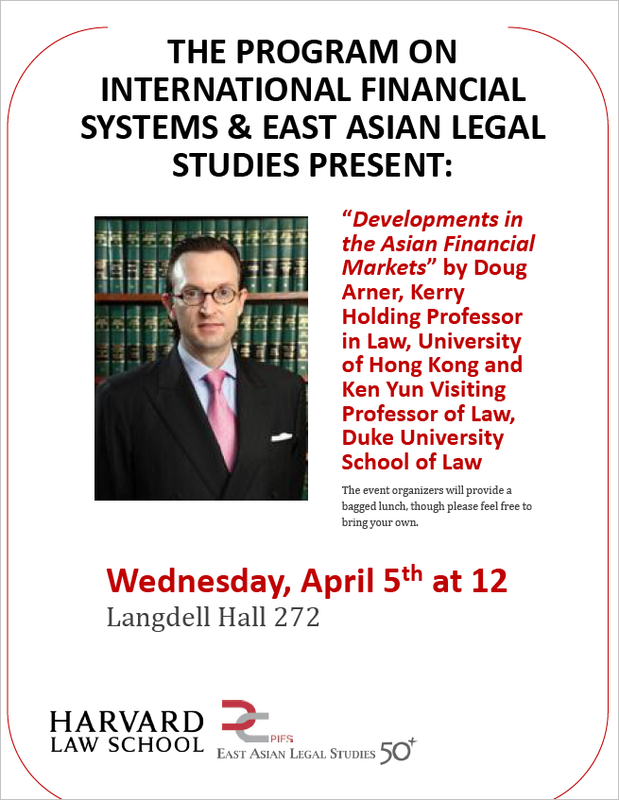 Mailing Address: EALS, Austin Hall 301, Harvard Law School, 1585 Massachusetts Avenue, Cambridge, MA 02138. Last modified April 12, 2019 by Emma Johnson. ©2002 President and Fellows of Harvard College. All rights reserved.